Gan Shmuel Group marketing manager Eyal Adut: "I am not saying the kibbutz will change fast, and I am not saying it is good that it will change. If it stays like this, it means our economic situation is good and we are doing well." In another world, Eyal Adut's life would probably be very different. As the marketing manager of a $250 million foods group, the father of three could allow himself and his family some luxury. But luxury is not part of his world and he does not care for it. Listed on the Tel Aviv stock exchange in 1993, Gan Shmuel Group is Israel's largest exporter of processed foods. Its business is kosher fruit juice which finds its way to over 40 countries every year, including Europe and the Far East, and into packaging available on shelves bearing Sainsbury's, Carrefour, Parmalat or Tropicana labelling. Gan Shmuel Group was born out of Kibbutz Gan Shmuel, established in northern Israel in 1942, that soon became a thriving orchard. The kibbutz (Hebrew for communal settlement) is a rural community. Just under 300 sprouted all over Israel, from as early as 1910, founded by young Jewish pioneers, mainly from eastern Europe, as they sought to build new lives. Most kibbutzim are similar: homes and gardens for members, children's nurseries, communal dining rooms, meeting rooms, care homes for the elderly, grocery stores; some even have spartan hotels for visitors or volunteers from across the country and overseas. The underlying philosophy is communist-based: a general assembly makes decisions, approves members, and authorises budgets. In 2008, their collective revenues, mostly derived from agriculture, reached $5 billion. Eyal Adut was born and raised on the 300-hectare kibbutz, where he now lives with his family and works. As he showed a group of European Union journalists around the kibbutz grounds and the factory earlier this month, he explained he earned a similar salary to every other member of the kibbutz and that it was turned over to the kibbutz in return for an allowance for his family. Across the country, the face of the kibbutz is changing: more and more employ outside workers (going directly against the original kibbutz philosophy), some are privatised, and others are floated on the stock exchange. Thousands of Israelis have met their spouses on kibbutzim, some continue to live on the grounds, some take up high-profile jobs in international media organisations or world-class scientific institutes, finding the kibbutz too small a world for them. Some leave and forge new lives in cities. Now home to an average 200 people, with a few, like Kibbutz Gan Shmuel numbering around 1,000, the kibbutz concept has hit several crises over the years. Resentment began to rumble years ago, not least when hundreds of Holocaust survivors found it particularly hard to hand over compensation awarded for their suffering to the kibbutz, or when increasing numbers of the younger members decided they were better off furthering their education and moving on. But many like Eyal Adut, whose family lives in one of the well-tended 150-square-metre houses and shares 50 kibbutz-owned cards with the rest of the members, hold fast to their traditional values and "give the best of themselves for the benefit of the community". "Everybody has different needs," Adut answers as journalists ask about his way of life. 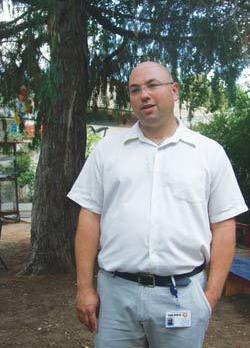 "I am not saying the kibbutz will change fast, and I am not saying it is good that it will change. If it stays like this, it means our economic situation is good and we are doing well. So maybe it is not so bad. Over there is the baby house, the children arrive at 7.30 a.m. and remain until 4 p.m.
"We have a school outside the kibbutz for all the children of the kibbutzim in the area. "They go home around 1 p.m. to have lunch and then they have activities till 4 p.m. We do not accept volunteers but some kibbutzim do. We have our own grocery store and we have a separate house for our dependent elderly members." Gan Shmuel Group's remarkable corporate profile is a stark contrast to the simplicity of the kibbutz members' lifestyle but is a testimony to the kibbutz's industry: 45 per cent of the group's 300 employees are kibbutz members, the rest hail from local areas and include Russian and Arab Israelis. In the 1940s, the few hundred members of the Kibbutz Gan Shmuel found there was no European market for citrus fruit following World War II and acres of produce were going to waste. Gan Shmuel began to process 200 tonnes of fruit a year, even making jams and preserves. By the 1960s, it was trading with the Japanese market, and scored a world first in 1974 when it accommodated the first aseptic packaging line for citrus products. In 1979, Kibbutz Gat and Kibbutz Beir Nir launched the Ganir company, processing citrus fruit for the international beverages market. Twenty years later it was selected exclusive juice supplier to McDonald's Israel. Meanwhile, Gan Shmuel's exports soared. In 2003 it acquired Gan Pelech to own 10 per cent of all Israel's orchards, and later bought overseas subsidiaries in Italy, Poland, Spain, Uruguay and South Africa. It also won the Kaplan Award twice in recognition of its increased production efficiency. Gan Shmuel and Ganir merged in 2007 to become the Gan Shmuel Group; 45 per cent of its stakeholding is held by the Gan Shmuel kibbutz members, 24 per cent is publicly held. Over 70 per cent of its raw material is Israeli. Gan Shmuel kibbutz members' earnings are ploughed back into kibbutz and goes towards paying land rent, housing and care, subsidising food, and the education for its 136 children and young people. Dividends from holdings contribute to pensions, acquisitions, and a 30 per cent contribution to members. "Gan Shmuel listed on the stock exchange to grow as a company, to move forward," Adut explains as little boys in Manchester United and Barcelona shirts play next to a house where an Israeli flag flies over the front door. "It is now in its fourth generation and is a public company in all aspects. I am very happy at the kibbutz. It has given me the opportunity to be the marketing manager of a $250 million company. I might not have had that opportunity elsewhere."